Fashions change, life moves on, but the problems with the apparel industry endure. 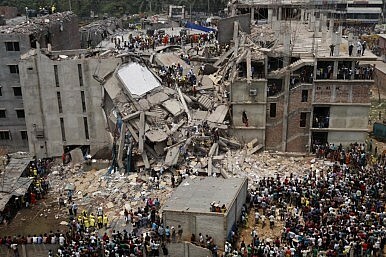 April 24 is the first anniversary of the Bangladesh’s Rana Plaza tragedy, in which a building housing garment workers collapsed, leaving 1,134 dead and more than 2,500 injured. At least 800 children were orphaned. The day is to be marked by the first “Fashion Revolution Day,” arranged by ethical fashion organizations. More than a hundred bodies had still to be identified as of April 9, almost one year after the tragedy. Meanwhile, the owner of the building was to be charged with murder, according to a police announcement last Tuesday. A trust fund set up in January for the survivors of the tragedy has raised about $15 million, still $25 million short of the estimated amount needed, according to the fund’s website. Donations have been available for victims and families to claim since March 24. The 29 brands that sourced from factories in Rana Plaza boast combined profits of more than $22 billion a year, and are being asked to contribute less than 0.2 percent of that amount to compensate those whose labors generate the profits, says Ineke Zeldenrust of Clean Clothes Campaign. The “Bangladesh Accord” published its first inspection report in March. The accord is a legally binding agreement created after the collapse, aimed at getting international stakeholders involved in the safety of the textile and garment industry in Bangladesh. That sector accounts for up to 30 percent of the country’s GDP. Shortly after the tragedy last year, there was discussion about possibly sanctioning and boycotting the country. In response, Bangladesh’s foreign minister called on international brands not to leave the country. Britain’s Minister of State for International Development Alan Duncan visited Dhaka in late March to check on progress. Duncan saw the disaster as an opportunity to fix the flaws and said that the U.K. is keen to help Bangladesh upgrade safety and security in the garment factories. As the first anniversary of the tragedy draws closer, documentaries have been spotlighting the human cost of fashion and consumers’ buying habits. The Shirt on Your Back, presented by The Guardian, pays tribute with a look at the personal stories in the aftermath of the tragic event. Another film by The New York Times similarly focuses on the costs of fashion in the context of the tragedy. “We want people to re-engage with fashion, slow things down a bit, love the clothes we buy more, care about how they are made and by whom,” Firth told Vogue Magazine.